Set with more than FIVE CRYSTALS per piece, this Multi-stone Sterling Crystal Ring is a fit for every party, thanks to its crystal grid-like design that attracts fame to name! 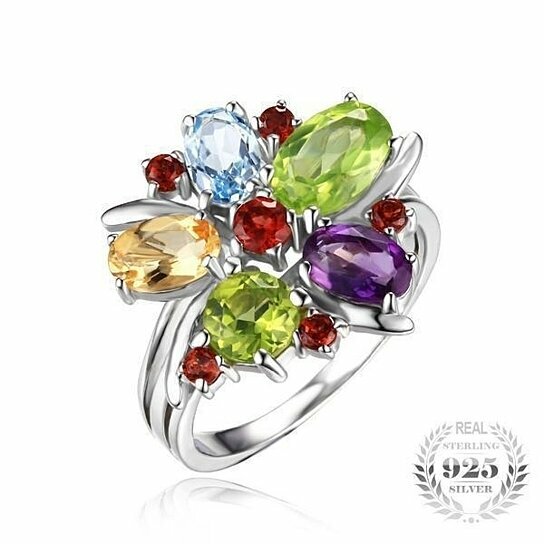 From Amethyst to Garnet, Peridot, Citrine and Blue Topaz this Ring & Bracelet combines the right blend of everything you need to spice any party, ladies! The set radiates seven varied color energies, each signifying a power to attract divine traits such as wisdom, love, popularity, wealth, fortune, beauty and authority.